Stephanie Dean, a volunteer with Spring Creek Horse Rescue, says hello to Sally on Sunday during Spring Creek’s annual open house. down-and-out people looking for a home for their horses. they also are at capacity. We need a bigger piece of property," McCracken said. Her comments were made during an open house Sunday afternoon at the rescue. McCracken said it pains her to turn away people in need. We do as much as we can," she said. The horse rescue moved to its current location on U.S. Highway 160 east near the Billy Goat Saloon about two years ago,after its lease at a previous location in Ignacio was not renewed. The move forced McCracken to down-size, from 125 acres to 35 acres, just as the need for shelter rose. She said the most significant aid Spring Creek could receive right now is donated land. Chip Burkett and his wife adopted a horse from the rescue several years ago and were at the open house Sunday. her on pack trips on area trails. She's a very good horse," Burkett said. In addition to hay, horses need veterinary attention, preventive dental work and regular hoof care. 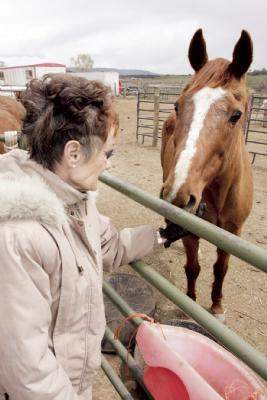 The costs add up, said Juliet Getty, who attended the open house and wrote Feed Your Horse Like a Horse. Horses are expensive to maintain," she said. When it becomes too much for an owner, McCracken often is the last hope. What she does is God's work. It really is," Getty said. Visit www.springcreekhr.org or call 884-4425.